Many horses suffer from joint pain, particularly as their golden years approach. When a horse's joints become swollen and painful, concerned owners should work with a vet to find the cause of the pain and provide relief. Ointments that reduce joint swelling may offer temporary or permanent solutions to the horse's pain. Topical analgesics have a reputation for safety and reliability. They may contain natural ingredients such as menthol, capsaicin, camphor or mint oil, which warm the joint and provide pain relief. Topical analgesics aren't meant for open cuts, as their astringent nature causes a stinging sensation, according to the website The Horse. Extremely absorbent and frequently utilized as a carrier agent for other veterinarian-approved treatments, topical analgesics containing dimethylsulfoxide (DMSO) help relieve swollen joint pain. Though DMSO produces heat that has proven effective in reducing swellings from old injuries, it can increase inflammation when applied to fresh injuries. Horse owners considering the use of DMSO should always consult a veterinarian first. 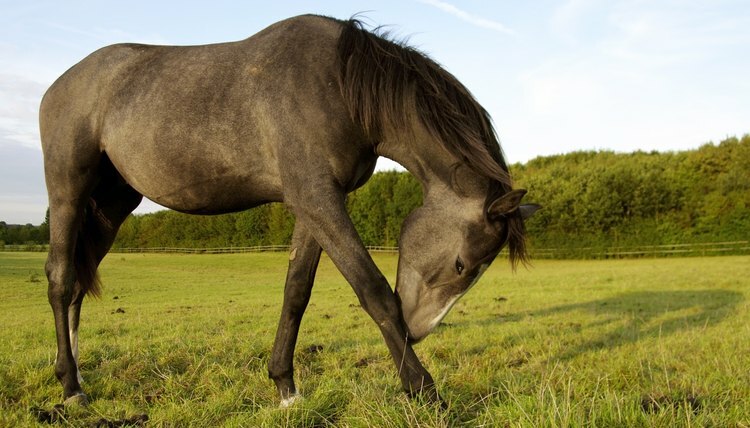 A thorough veterinary exam helps provide answers for owners seeking a solution to their horse's recurring joint pain. The veterinarian can provide treatment options, which may include prescription ointments. One such medication is diclofenac liposomal cream, a topical ointment containing 1 percent diclofenac sodium. In a 2007 study performed by the American Association of Equine Practitioners, this ointment improved cartilage hydration and lubrication and decreased joint erosion.